It is our great pleasure to announce the winner of the Australasian Association of Writing Programs (AAWP) X Ubud Writers & Readers Festival Emerging Writers’ Prize 2018. The winner is Sophie Overett for Sea Wife. AAWP and UWRF would like to thank all writers who submitted to the prize. 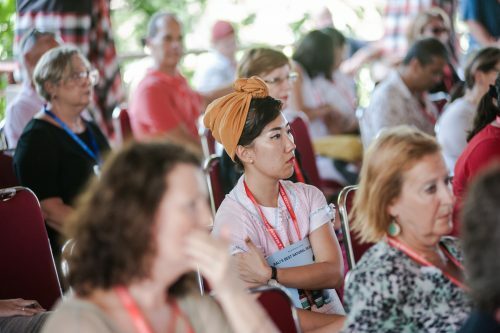 The judges were overwhelmed by the nuanced responses to the UWRF18 theme and the quality and diversity of entries. We are proud to support emerging writers in offering this opportunity to them. AAWP and UWRF would like to acknowledge the generosity of the judges. Heartfelt thanks. In The Sea Wife, Sophie Overett turns her attention to myth in order to explore the tragedy of love in a world that inevitably destroys. Suffused with exquisite aquatic imagery that reflects the currents in the main protagonist’s own moods, this richly layered story charts the interplay of life and death, memory and murder, feeling and language. It is an intense and hauntingly atmospheric story. Sophie Overett is an Australian writer and cultural producer. Her writing has been published in journals and anthologies around the world. In 2015, she was a Queensland Literary Fellow, and her YA manuscript, Agatha Abel Meets Her Maker, was shortlisted for the Text Prize. In 2016, her adult manuscript, The Rabbits, was shortlisted for The Richell Prize, and in 2018, her novelette, They Built Us Out of Buried Things will be published by Tiny Owl Workshop. She is one half of Lady Parts, a podcast about women’s roles in genre cinema, and blogs at sophieoverett.com.